The Panama City Marina project is moving forward, but not without some contention. Tuesday’s public meeting on the Panama City Marina brought out many locals. The project’s developer Bob Sonnenblick laid out the latest designs. Among the changes: more green space, a boardwalk, and a public fishing pier. 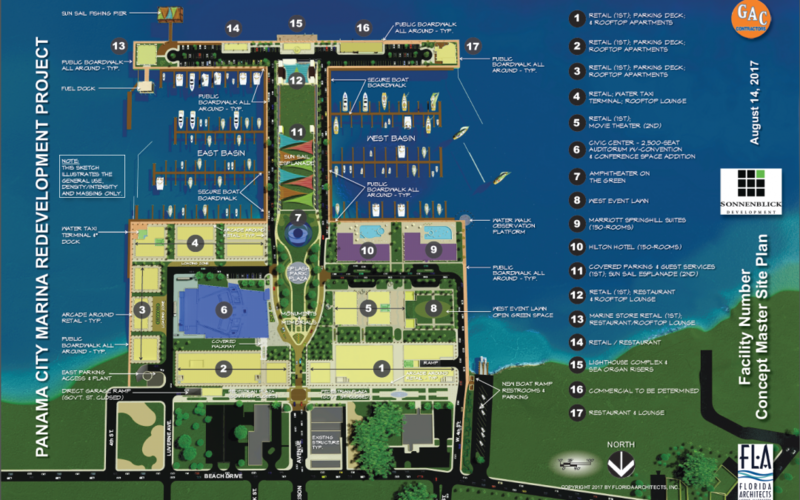 also includes an amphitheater, water taxi terminal and retail stores with apartments on top. “While I don’t know all the details. They’ve changed so much about the marina project. I do think that the growth and the potential that it has to bring more people to our area is great and I think it will be great for businesses,” Karen Vargas Hatcher, owner of Planted True said. City leaders say things aren’t set in stone. Others say the plans may be headed in the wrong direction. Lindsey says adding outlet stores to the plan may harm existing downtown businesses. “If we bring in outlet stores we will have all of these stores that sell that type of things have a difficult time staying in business,” Lindsey said. The Panama City Commission will meet again Tuesday to hear from locals who didn’t get a chance to speak at the last public hearing.